Construction of bicycle and pedestrian facilities is about to begin on Roop Street between Winnie Lane and Northridge Drive! Although short, this stretch of road is currently one of the more dangerous areas in town for cyclists and pedestrians. Safe and well used bicycle facilities exist on either side of Lone Mountain, but cyclists must brave fast traffic and a crumbling shoulder if they wish to connect the two areas. And although pedestrians are instructed not to use this route, no other reasonable routes exist nearby. It’s not uncommon to see a baby stroller being pushed through the dirt and gravel on the side of the road to get over the hill to the shopping center. Work is expected to begin August 27 on a Carson CIty project to provide bicycle and pedestrian improvements on North Roop Street from Winnie Lane to Northridge Drive. 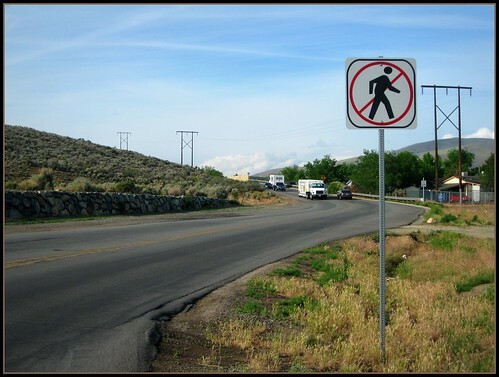 The Carson City Regional Transportation Commission has awarded a contract which will connect existing bicycle and pedestrian facilities in Carson City, according to a news release. Roop Street between Winnie Lane and Northridge Drive currently does not have a sidewalk or bike lanes, and people often try to use a narrow strip of concrete against a wall to travel this section of road. After the project is completed this fall, there will be bike lanes on both sides of the road and sidewalk connections to existing sidewalks on North Roop Street and Northridge Drive. There has been widespread support from the City’s bicycling and walking community and from school district representatives. City representatives are very pleased that this project is being implemented. “We’re happy to implement a project which connects other existing facilities and will provide for safety improvements” said Patrick Pittenger, Transportation Manager in the Carson City Public Works Department. The project is being funded primarily by a Federal grant acquired by City staff through the Nevada Department of Transportation (NDOT). This project is one of several bicycle and pedestrian projects recently funded through grants overseen by NDOT. “The Nevada Department of Transportation is pleased to work with our local partners to implement a project with funds secured by the State” said Tracy Larkin-Thomason, Assistant Director of Planning for the Nevada Department of Transportation. The road is expected to remain open to traffic except for a one-week period planned for early October. Motorists are thanked for their patience and safe driving in the work zone. For additional information, please contact Patrick Pittenger at (775) 283-7396. When completed, Roop Street over Lone Mountain will safely connect neighborhoods and businesses on both sides of the hill. It will also further complete the longest, continuous north-south bicycle route in Carson City, stretching from Emerson Drive on the north to Silver Sage near the county line on the south. It has been a long time coming, and we can’t wait! SWEET!!! This will give me another option for route to work. Currently I complete bypass all this and come up Hot Springs road to Roop then go through Emerson to Arrowhead and take that to work. Really wish they would extend this on Arrowhead as there are some areas where vehicles really have no room for you and you get very close to being pushed off the road.